Rupture Phase. Centuries of tidal pumping (explained on page 124 and pages 612–613) in the subterranean chamber steadily increased its temperature and pressure. The subterranean water soon became supercritical, as explained on pages 124–125. Increasing heat losses in the chamber eventually balanced the constant heat input by tidal pumping, so temperatures (and pressure) no longer increased. The overlying crust was stretched, just as a balloon is stretched by internal pressure. The rupture began with a deep crack at the Earth’s surface. Because stresses in tension cracks are concentrated at each end of the crack, both ends grew rapidly—at about 3 miles per second.47 Within seconds, this crack penetrated down to the subterranean chamber and then followed the path of least resistance. The rupture probably completed its path around the Earth in about 2 hours.48 Initial stresses were largely relieved when one end of the crack ran into the path left by the other end. In other words, the crack traveled a path that intersected itself at a large angle, forming a “T” on the opposite side of the Earth from where the rupture began. That “T” can be seen inside the circle in Figure 44 on page 114. As the crack raced around the Earth along a great-circle path, the 60-mile-thick crust opened like a rip in a tightly stretched cloth. Pressure in the subterranean chamber directly beneath the rupture suddenly dropped to nearly atmospheric pressure. This caused supercritical water to explode with great violence out of the 60-mile-deep “slit” that wrapped around the Earth like the seam of a baseball. Figure 59: Jetting Fountains. For a global perspective of what this may have looked like, see page 110. All along this globe-circling rupture, whose path approximates today’s Mid-Oceanic Ridge,49 a fountain of water jetted hypersonically into and far above the atmosphere. Some of the water fragmented into an “ocean” of droplets that fell as torrential rain great distances away. This produced rains such as the Earth has never experienced—before or after. Other jetting water rose above the atmosphere, where it froze and then fell on various regions of the Earth as huge masses of extremely cold, muddy “hail.” That hail buried, suffocated, and froze many animals, including some mammoths. [For details, see “Frozen Mammoths” on pages 269–299.] The most powerful jetting water and rock debris escaped Earth’s gravity and became the solar system’s comets, asteroids, and meteoroids. [For details, see “The Origin of Comets” on pages 303–338, and “The Origin of Asteroids, Meteoroids, and Trans-Neptunian Objects” on pages 341–381.] To understand the gigantic energy source that launched this material, one must study “The Origin of Earth’s Radioactivity” on pages 387–441. Carried up in the fountains were seeds and spores. Those that remained in the atmosphere settled for years after the flood, repopulating the plant kingdom globally. Figure 60: Flood Phase. Sediments in the escaping water increased until their volume nearly equaled the volume of water gushing out. These suspended particles quickly settled and buried plants and animals in a chaotic mixture. During this phase, a phenomenon called liquefaction sorted sediments, animals, and plants into uniform horizontal layers that covered vast areas. Traces of these dead organisms are called fossils. Global liquefaction is explained on pages 197–213. Flood Phase. Each side of the rupture was initially a 60-mile-high cliff. In the bottom 90% of the cliff face, compressive, vibrating66 loads greatly exceeded the rock’s crushing strength, so the bottom 90% continually crumbled, collapsed, and spilled out into the jetting fountains. That removed support for the top 10% of the cliff, so it also fragmented and fell into the pulverizing hypersonic flow. The 46,000-mile-long rupture rapidly widened, reaching an average width of about 1,400 miles all around the Earth. Sediments swept up in the escaping flood waters gave the water a thick, muddy consistency. These sediments rapidly settled out over the Earth’s surface, burying many plants and animals, forming the fossil record. The downward sagging edges of the massive hydroplates slowly closed the powerful jetting fountains, but massive amounts of water continued to leak out. Because today’s major mountains had not yet formed, global flooding covered Earth’s relatively smooth topography. As explained on page 125, salt had precipitated out of the supercritical subterranean water before the flood began, covering the chamber floor with solid, but mushy, salt. Escaping water swept much of it out of the chamber. When sediments falling through the flood waters blanketed the pasty, low-density salt, an unstable arrangement arose, much like having a layer of light oil beneath a denser layer of water. A slight jiggle of that mixture will cause the lighter layer below to flow up as a plume through the denser layer above. A plume of salt is called a salt dome. [See Figure 62.] Deep salt layers—some 20,000 feet below today’s sea level30—are resting on what was the much deeper chamber floor. Wherever the chamber roof was blown off, the floor below rose. Two such places are now the Gulf of Mexico and the Mediterranean Sea. Also, the edges of each hydroplate sagged downward, because the pressure below the edges was less than the pressure below the center of the hydroplates. This eroded the bottom edges even more. Consequently, after the hydroplates settled onto the chamber floor, continental shelves and slopes existed worldwide. 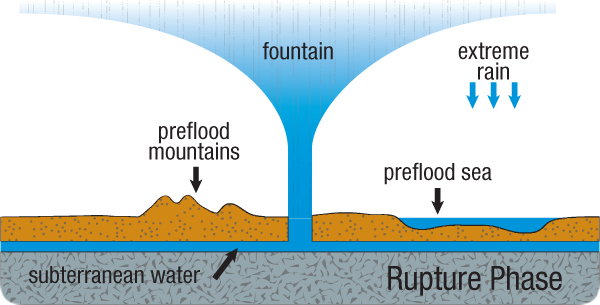 During the flood, thick layers of sediments blanketed the granite crust, forming aquifers—permeable, sedimentary layers filled with generally salt-free water. Today, some of those aquifers lie below the continental shelf which constitutes part of the sea floor. Figure 62: Salt Dome. Just as a cork released at the bottom of a swimming pool will float up through water, wet salt can float up through denser, freshly deposited sediments. A salt dome begins to form when a small part of a wet salt layer rises. Other salt in the layer then flows horizontally and up into a rising plume. If the salt is thick and saturated with water, friction offers little resistance, and salt will continue to feed into the rising plume. The upturned (or bowl-shaped) layers next to the salt dome can become traps in which oil collects, so understanding salt domes has great economic value. Note: If all the sediments in and above the salt layer had not been loose, freshly deposited, and nearly frictionless (saturated with water), there would be no salt dome. Today, on the floor of the Gulf of Mexico, SCW sometimes escapes up through salt domes and precipitates asphalt (tar), the least volatile component of petroleum.46 What is the hydrocarbon source? Obviously, organic material. Recall that black smokers—with their escaping SCW—are usually surrounded by buried vegetation and large ecosystems, such as swarms of giant tubeworms feeding on chemicals dissolved in SCW. That organic material is quickly dissolved by the SCW when the vents shift locations. As the SCW jets up into the cold sea water and cools, hydrocarbons quickly precipitate, paving the seafloor with a tar residue. Flooding uprooted most of Earth’s abundant vegetation and transported it to regions where it accumulated in great masses. [Pages 197–213 explain how this vegetation was collected and sorted into thin layers within the sediments.] Later, at the end of the continental-drift phase, buried layers of vegetation were rapidly compressed and heated, precisely the conditions that laboratory experiments have shown will form coal and oil.72 The flood phase ended with continents near the positions shown in Figure 53 and the top frame of Figure 66. Figure 63: Continental-Drift Phase of the Flood. Continental-Drift Phase. Material within the Earth is compressed by overlying rock. Rock’s slight elasticity gives it springlike characteristics.73 The deeper the rock, the more weight above, so the more tightly compressed the “spring”—all the way down to the center of the Earth. As the Mid-Atlantic Ridge began to rise, the granite hydroplates started to slide downhill on the steepening slopes. This removed even more weight from what was to become the floor of the Atlantic Ocean, so the floor rose faster, the slopes increased, and the hydroplates accelerated, removing even more weight, etc. The entire Atlantic floor rapidly rose about 30 miles. a) Overlying rocks keep a compressed spring horizontal. b) Rupture completed. Jetting water not shown. c) The spring remains aligned and compressed as the gap between the rocks widens. d) The rupture’s path widens by the erosion, crumbling,78 and collapse of the unsupportable vertical walls, exposing part of the chamber floor. Most of Earth’s sediments (tens of millions of cubic miles of sediments) are quickly produced by escaping, high-velocity waters— the fountains of the great deep. e) When the gap reaches a certain critical width, the spring suddenly buckles upward. Now consider thousands of similar but parallel springs lined up behind the first spring— all linked together and repeating, in unison, steps a–c. The upward buckling of any one spring will cause adjacent springs to become unstable and to also buckle up. They, in turn, will lift the next spring, and so on, in ripple fashion (like falling dominoes), but slowly, because the Mid-Oceanic Ridge is so massive. f) Continental-drift phase begins. The Mid-Atlantic Ridge “springs” upward, releasing the large amounts of energy contained in compressed rock. So the Mid-Oceanic Ridge, beginning in the center of the Atlantic, slowly grew in both directions, eventually extending into the other oceans. Figure 64: Spring Analogy Showing Development of the Mid-Atlantic Ridge. Figure 65: Birth of Mid-Atlantic Ridge and the Ultimate Slippery Slope. Ice is slick, especially if one is on ice skates, because as long as ice is under the great pressure of the metal blades, that ice normally turns to liquid water. So ice skaters are actually sliding on liquid water. Imagine how fast a skater—or a hydroplate—would slide down a mountainside the size of the Mid-Atlantic Ridge, whose surface was fifty times slicker than liquid water! 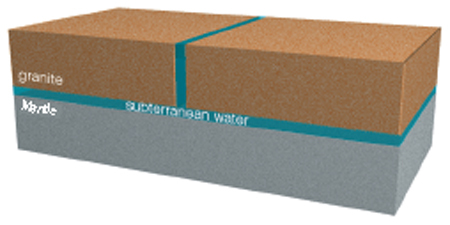 Supercritical water (SCW) has a viscosity (frictional resistance) about one-fiftieth that of normal water. SCW provided almost no resistance to the massive sliding hydroplates; it was much like riding on a cushion of air.74 Later in this book, we will calculate that speed. If you haven’t studied Figure 50 on page 117, the answer will surprise you. Contrast that with the century-old problem geologists have trying to understand how the rock in massive continental plates can scrape over and through mantle rock, which is a solid, not a liquid. Obviously, the plates cannot. Geologists have a serious problem. Continental plates accelerated away from the widening Atlantic. Recall that the rupture encircled the Earth, and the escaping subterranean water widened that rupture to an average of about 1,400 miles—on both the Atlantic and Pacific sides of the Earth. Plates then slid away from the rising Mid-Atlantic Ridge and toward that 1,400-mile-wide gap on the Pacific side of the Earth.77 The next chapter will explain why the Pacific floor simultaneously dropped as the Atlantic floor rose, further steepening the downhill slide and removing obstacles to the accelerating hydroplates. 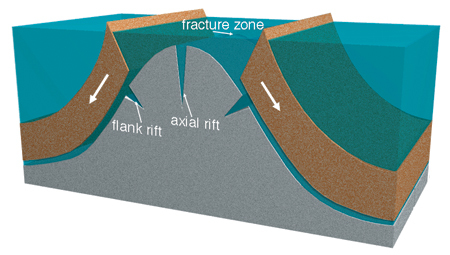 Figure 66: Computer Animation of the Continental-Drift Phase. The top frame shows one side of the Earth at the end of the flood phase. Because the rupture encircled the Earth, a similar eroded gap existed between the continental plates on the other side of the globe. The Mid-Oceanic Ridge rose first in the Atlantic, hours or days before the ends of the rising ridge extended into what is now the Pacific. This caused the hydroplates to accelerate downhill on a layer of lubricating water, away from the widening Atlantic and into the gap on the opposite side of the Earth. The continental-drift phase ended (bottom frame) with the dramatic compression event that squeezed up Earth’s major mountain ranges. These six frames simply rotate the present continents about today’s polar axis. Therefore, greater movement occurs at lower latitudes. Movement begins from where the continents best fit against today’s base of the Mid-Atlantic Ridge (Figure 53 on page 120) and ends near their present locations. While it may seem strange to think of squeezing, thickening, and shortening granite, one must understand the gigantic forces required to decelerate sliding continental plates. If compressive forces are great enough, granite deforms, much like putty, on a global scale. On a human scale, however, one would not see smooth, puttylike deformation; instead, one would see and hear blocks of granite fracturing and sliding over each other. Some blocks would be the size of a small state or province, many would be the size of a house, and even more would be the size of a grain of sand. Friction at all sliding surfaces would generate heat. At great depths, this would melt rock. Liquid rock (magma) would squirt up and fill spaces between the blocks. This is seen in most places where basement rocks are exposed, as in the Black Canyon of the Gunnison (Figure 70) and the inner gorge of the Grand Canyon (Figure 71). To illustrate this extreme compression, imagine yourself in a car traveling 45 miles per hour. You gently step on the brake as you approach a stop light and brace yourself by straightening and stiffening your arms against the steering wheel. You might feel 15 pounds of compressive force in each arm, similar to what you would feel lifting 15 pounds above your head with each hand. If we repeated this deceleration at the stop light, but each time doubled your weight, the compressive force in your arms would also double. After about six doublings, especially if you were sitting on a lubricated surface, your arm bones would break. If your bones were made of steel, they would break after nine doublings. If your arm bones were one foot in diameter and made of granite, 17 doublings would crush them. If the decelerating mass was a hydroplate, the compressive forces would increase enough to crush and thicken the hydroplate and push up major mountain chains and create overthrusts in less than an hour. [For details, see “Can Overthrusts Occur? Can Strata Fold? Can Mountains Buckle?” on page 206.] Water could then drain off the thickened continents and into the newly opened and very deep ocean basins. For each cubic mile of land that rose out of the flood waters, one cubic mile of flood water drained. Compressing a long, thin object, such as a yardstick, produces no bending or displacement until the compressive force reaches a certain critical amount. Once this threshold is exceeded, the yardstick (or any long compressed beam or plate) suddenly arches into a bowed position. Further compression bows it up even more. Buckling a hydroplate at one point also bends adjacent portions. Therefore, mountain chains were pushed up by the crushing of hydroplates. Where the compression exceeded the crushing strength of granite, the plate thickened and shortened. The collapse of strength in the crushed region increased the load on adjacent regions, causing them to crush and the mountain chain to lengthen. Therefore, bending and crushing rapidly lifted mountain ranges. Naturally, the long axis of each buckled mountain was generally perpendicular to its hydroplate’s motion—that is, parallel to the portion of the Mid-Oceanic Ridge from which it slid. So, the Rockies, Appalachians, and Andes have a north-south orientation. (Later sections of this book will explain why, in the years after the flood, melting deep inside the Earth produced the Earth’s core and further vertical changes at the Earth’s surface.) The forces acting during this dramatic event were not applied to stationary (static) continents resting on other rocks. The forces were dynamic, produced by rapidly decelerating hydroplates riding on lubricating water that had not yet escaped. Figure 67: Upward Buckling. The floor of a limestone quarry buckled upward in Yorkshire, England, in 1887.70 The explanation is quite simple. Shale, which lay beneath the floor, consists of platelike particles that can slide over each other like playing cards in a deck. The weight of the quarry’s walls squeezed shale toward the center of the quarry, increasing the upward pressure on the quarry floor. Once the slightest upward buckling began, the limestone floor weakened, allowing the shale to push up even more. In the flood cataclysm, the “quarry” was about 60 miles deep, hundreds of miles wide, and 46,000 miles long. The high upward pressure on the “exposed” portion of the subterranean chamber floor was no longer balanced by the weight of the crust pressing down. Therefore, that portion of the chamber floor increasingly bulged upward, as happened in the quarry. Eventually, the hydroplates, still supported by high-pressure water, began to slide downhill, away from the rapidly rising bulge. This removed even more weight from the chamber floor, accelerating its upward bulging. Today, the upbuckled region is the globe-encircling Mid-Oceanic Ridge. Mechanical and civil engineers call this phenomenon “the buckling of a plate on an elastic foundation.”71 I have demonstrated this to hundreds of audiences. Place long bricks on top of a foam mattress that is horizontally compressed in a rigid box. Then, slowly remove the bricks from the foam mattress, beginning at the center and moving outward. When enough bricks are removed, the mattress suddenly springs upward, raising the remaining bricks. If these bricks were on a frictionless surface (such as water), they would accelerate downhill, just as continents (hydroplates) did during the continental-drift phase. When the hydroplates crashed, hours after continental drift began, mountains worldwide were buckled up and wide ocean basins opened up. Although a void opens up under the upbuckled foam mattress, no void would open deep inside the Earth, because pressures are too great. Consequently, high-pressure rock from below would buckle up to fill the space. That would not leave a void farther down, because even deeper rock would be squeezed up to fill the space. Ultimately, mass from the opposite side of the Earth must depress to compensate for the rising Mid-Atlantic Ridge—and the entire Atlantic floor. Therefore, the Pacific and Indian Oceans rapidly formed. Evidence and details are given on pages 155–192. PREDICTION 3: Salty water frequently fills cracks in granite, 5-10 miles below the Earth’s surface (where surface water should not be able to penetrate). Some high-pressure subterranean water was quickly injected up into cracks in the crushed granite. This explains the concentrated saltwater discovered in cracks 7.6 and 5.7 miles under Russia and Germany, respectively. Remember, surface water cannot seep deeper than 5 miles,20 implying that subsurface water was the source. This explains why the water’s salt concentration in these cracks was about twice that of seawater. Because that high concentration of subterranean saltwater mixed during the flood with an approximately equal volume of preflood surface water (which had little dissolved salt), the new oceans gained most of their present salt. Surrounding the Pacific is the “Ring of Fire,” containing the greatest concentration of earthquake and volcanic activity on Earth. On the floor of the Pacific and surrounded by the Ring of Fire, are vast, thick lava flows and 40,000 volcanoes, each taller than 1 kilometer. Frictional heating caused by high-pressure movements under the Pacific floor generated these lava outpourings that covered the Pacific hydroplate. Recovery Phase. Where did the water go? When the compression event began on a particular hydroplate, the plate crushed, thickened, buckled, and rose out of the water. As it did, the flood waters receded. Figure 68: Recovery Phase of the Flood. Simultaneously, the upward-surging, subterranean water was “choked off” as the plates settled onto the subterranean chamber floor. With the water source largely shut off, the deep, newly-opened basins between continents became reservoirs into which the flood waters returned. As you will recall, the floor of the subterranean chamber was about 60 miles below the Earth’s surface. Consequently, a few centuries after the flood, sea level was much lower than it is today. This provided land bridges between continents, allowing animal and human migration for perhaps several centuries. Draining flood waters swept vegetation, its attached bacteria, and sediments onto the new ocean floors. There, the bacteria fed on the vegetation and produced methane. Much of this methane has combined with cold, deep ocean waters to become vast amounts of methane hydrates along coastlines. Flood waters draining down steep continental slopes eroded deep channels called submarine canyons. They are now on the ocean floor, but downstream of today’s major rivers. As sea level rose in the centuries after the flood, animals were forced to higher ground and were sometimes isolated on islands far from present continental boundaries. Classic examples of this are finches and other animals Charles Darwin found on the Galapagos Islands, 650 miles off the coast of Ecuador. Today, those islands are the only visible remains of a submerged South American peninsula. Darwin believed the finches were blown there during a giant storm. Even if Darwin’s unlikely storm happened, both a male and female finch, rugged enough to survive the traumatic trip, must have ended up on the same island. The more sediments continents carried and the thicker continents grew during the compression event, the deeper continents sank. This also depressed the Moho beneath them. Newly formed mountains sank even more, depressing the Moho as deep as 50 miles below the Earth’s surface. [See Figure 69.] As ocean floors rose in compensation, the Moho below them rose as well. This is why continents are so different from ocean bottoms and why the Moho (where it can be detected) is so deep beneath mountains and yet so shallow beneath the ocean floor. Figure 69: Typical Cross Section of Today’s Continents and Oceans. 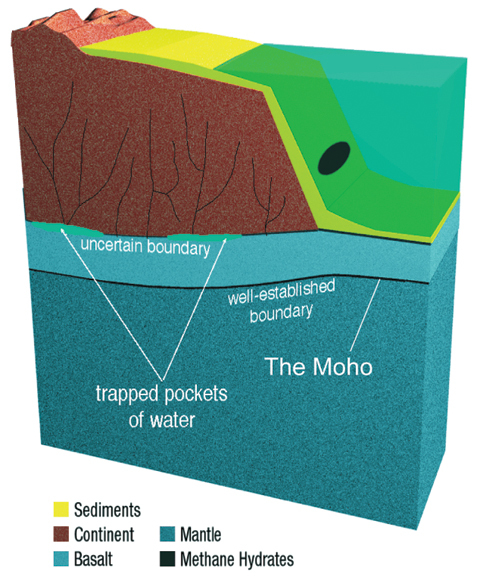 Notice how the Moho is depressed under major mountains and higher under the ocean floor.Although some boundaries are uncertain, most of these general characteristics are well known. Also notice that large pockets of water should be under major mountains. Earth Roll. The sudden formation of major mountains altered the spinning Earth’s balance, causing the Earth to slowly roll somewhere between 34°–57°.83 The North Pole, then in what is now central Asia, began a slow shift to its present position.84 (The shift produced a 6° precession of the Earth’s axis that Dodwell discovered from studying almost 100 astronomical measurements made over the last 4,000 years. (Satellite pictures also support this 6° precession. )83 That is why coal,13 dinosaur fossils,85 and other temperate fossils86 are found near today’s South Pole and fossils show that baby hadrosaurs lived year-round in today’s Arctic.87 Many researchers have also discovered vast dinosaur and mammoth remains inside the Arctic Circle. All were at temperate latitudes before and during the flood but rolled to their present latitudes after the flood. Ellesmere Island and Axel Heiberg Island may have the largest known contrast between current temperatures and inferred ancient temperatures based on fossils. Both islands straddle 85°W longitude. Therefore, regions near this longitude experienced large northward shifts after the flood. On the opposite side of the Earth, the preflood North Pole rolled south near 95°E longitude while, points along 85°W longitude (including today’s North Pole) rolled to the north. Also implied is a roll of at least 34°. Physics,83 geology,84 and biology85–97 give a similar picture. Endnote 83 explains why the Asian sky began “sinking” toward the north immediately after the flood. Page 603 describes a similar historical account of a “cosmic upheaval” that is preserved in ancient Vedic and classical Sanskrit texts. Canyons. Drainage of the waters that covered the Earth left every continental basin filled to the brim with water. Some of these postflood lakes lost more water by evaporation and seepage than they gained by rainfall and drainage from higher elevations. Consequently, they shrank over the centuries. A well-known example was former Lake Bonneville, part of which is now the Great Salt Lake. Through rainfall and drainage from higher terrain, other lakes gained more water than they lost. 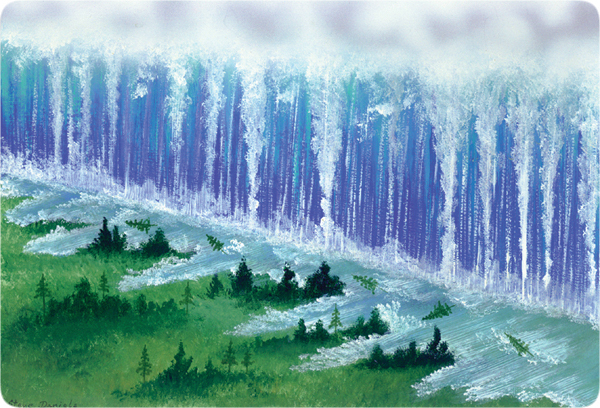 Thus, water overflowed each lake’s rim at the lowest point on the rim. The resulting erosion at that point on the rim allowed more water to flow over it. This eroded the cut in the rim even deeper and caused much more water to cut it faster. Therefore, the downcutting accelerated catastrophically. The entire lake quickly dumped through a deep slit, which we today call a canyon. These waters spilled into the next lower basin, causing it to breach its rim and create another canyon. It was like falling dominoes. The most famous canyon of all, the Grand Canyon, formed primarily by the dam breaching of what we will call Grand Lake. It occupied much of southeast Utah, parts of northeastern Arizona, and small areas of Colorado and New Mexico. [See the map on page 216 and pages 217–251.] Grand Lake, standing at an elevation of 5,700 feet above today’s sea level, quickly eroded its natural dam 22 miles southwest of what is now Page, Arizona. As a result, the northwestern boundary of former Hopi Lake (elevation 5,950 feet) was eroded, releasing its waters that occupied the present valley of the Little Colorado River. With thousands of large, high lakes after the flood, many other canyons were carved. “Lake California” filling the Great Central Valley of California carved a canyon (now filled with sediments) under what is now the Golden Gate Bridge in San Francisco. The Strait of Gibraltar was a breach point as the rising Atlantic Ocean eventually spilled eastward into the Mediterranean Basin. The Mediterranean Sea, in turn, spilled eastward over what is now the Bosporus and Dardanelles, forming the Black Sea. Here at the Black Canyon of the Gunnison in Colorado, cliffs are exposed for up to 2,700 feet above the Gunnison River. Their marble-cake appearance comes from melted rock, primarily quartz, that was forced up through cracks in the darker rock.79 To appreciate the size of this cliff, notice the trees, 10 –15 feet tall, at the top of the cliff. Now, let’s put aside all prior opinions and ask, “What caused this marble-cake pattern?” First, deep magma must be present or be produced. Figure 70: Black Canyon of the Gunnison. If compressive forces acted slowly but were almost evenly balanced, slight but slow movements would occur at the molecular level, a phenomenon called creep. The rock would slowly flow like putty, until the forces balanced. Some channels (or cracks) are wider than others. Normally, the largest channels provide the least flow resistance, so all the magma from below should have spilled out through them. (Pump a liquid into a closed container until it cracks. You will see only one or at most a few major cracks, not many little cracks.) If the magma had been contained in a chamber below, just waiting for a crack to appear, the first crack should release all the magma, unless it solidified on its way up through the colder rock. But if all cracks formed simultaneously, then magma would fill most cracks. All this leaves us with one conclusion for how the fractures occurred—rapid crushing. Next, magma must rapidly squirt up through the cracks in the black rock. If it happened slowly, or even at the rate a river flows, the front edge of the upward-flowing magma would solidify (freeze), stopping the flow. If water is dissolved in any molten rock, its melting temperature is lowered considerably. Therefore, melted quartz with dissolved water would be more likely to complete the cold, upward journey. 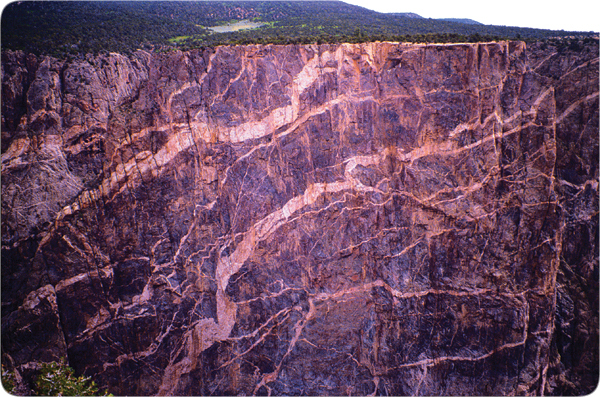 Each channel (or vein) at the Black Canyon has a fairly uniform thickness. This reveals that the liquid’s pressure exceeded the rock’s pressure by nearly the same amount all along the channel. Again, this would not happen if the flow were slow or had the consistency of cold tar. This marble-cake appearance is exposed for at least 50 miles along the Gunnison River, so the compressive force must have been about the same over at least those 50 miles. Magma, if it came from one spot below, would tend to escape through the shortest cracks leading to the surface. Instead, magma has filled cracks over a 50 mile range. Consequently, the magma source and any water were probably spread over a large area directly below. Because similar structures are seen where other deep basement rocks are exposed at the Earth’s surface, these gigantic forces either “cropped up” many times at different places or this happened once on a continental or global scale. The parsimony criterion (seeking the simplest explanation) leads us to favor one big event. We will call this the compression event. 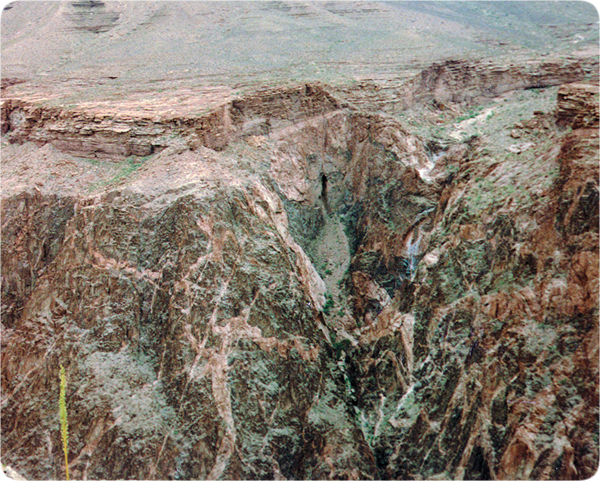 Figure 71: Inner Gorge of the Grand Canyon. The same marble-cake pattern exists in the inner gorge of the Grand Canyon, but with less color contrast than at the Black Canyon of the Gunnison. We can conclude that this crustal rock was rapidly crushed over a wide area. Magma (probably containing dissolved water) was then quickly injected up through the cracks. 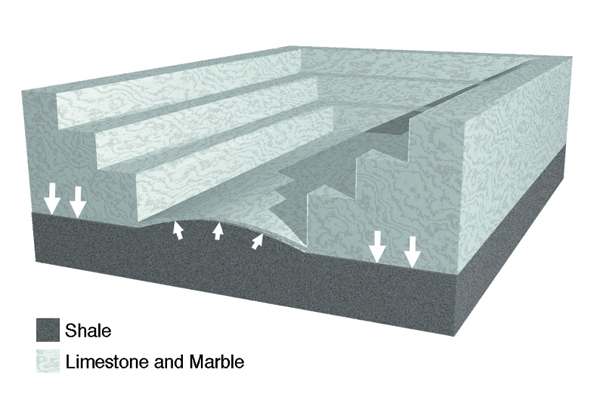 In studying this effect—an immense layer of “marble-cake rock”—we tried to deduce its cause. One can easily err when reasoning from effect back to cause. Another approach, reasoning from cause to effect, requires starting assumptions. We began this cause-to-effect study of the flood on page 122 with only three assumptions and then looked at their logical consequences. When “cause-to-effect reasoning” is consistent with “effect-to-cause reasoning,” as it is here, confidence in our conclusion increases greatly. Earthquakes. The flood produced great mass imbalances on Earth; today those imbalances cause earthquakes. Continents (crushed, buckled, thickened and loaded with sediments) sank into the mantle and lifted ocean floors. Mountain ranges sank into the mantle and raised plateaus. [See beginning on page 226.] Shifting material within the Earth is the root cause of earthquakes and the slow shifting of continents. Both phenomena have been misinterpreted as supporting plate tectonics. The next chapter will explain this in greater detail. Ice Age. As mentioned on page 116, an ice age requires cold continents and warm oceans. Indeed, even the Arctic Ocean was a warm 73°F (23°C) soon after the Mid-Oceanic Ridge formed. While standard climate models, even making use of liberal assumptions, fail to explain this discovery,105 the flood does. 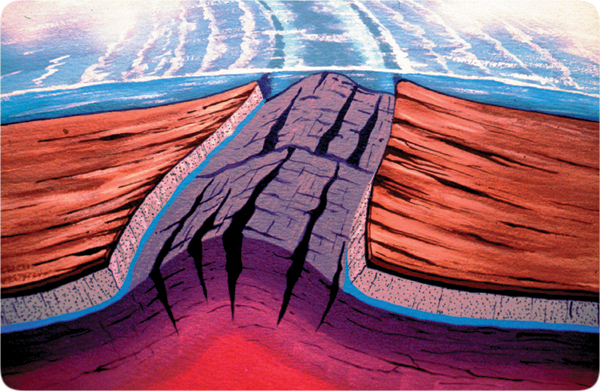 Sliding hydroplates generated frictional heat, as did movements within the Earth resulting from the rising of the Atlantic floor and subsiding of the Pacific Ocean floor. Floods of lava spilling out, especially onto the Pacific floor, became vast reservoirs of heat that maintained elevated temperatures in certain ocean regions for centuries—the ultimate and first “El Niño.”106 Warm oceans produced high evaporation rates and heavy cloud cover. Temperatures drop about 3.5°F for every 1,000 feet of elevation increase. Therefore, after the flood, the elevated continents and lower sea level produced colder continents. Also, volcanic debris in the air and heavy cloud cover shielded the continents from much of the Sun’s rays. Finally, lowered sea levels meant warmer oceans. 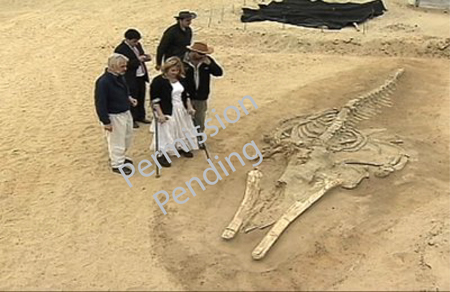 Figure 72: Desert Whales. In 2010, more than 80 fossilized whales (adult and juvenile baleen whales and an extinct sperm whale) were discovered in a narrow 65-foot by 800-foot strip near the costal town of Caldera, Chile—in the Atacama Desert, the driest desert in the world, where rain has never been recorded.92 Other fossils included sharks, a porpoise, a bird with a 17-foot wingspan, an extinct tusked dolphin, and a possible seal. From erosion patterns, researchers at this site could tell that diatomacious earth was swept in, but how could sea bottom sediments get swept uphill, 3,800 feet above sea level, and why were these sediments so thick—up to 260 feet thick? If the seafloor rose, what forces, energy, and mechanisms were involved? Obviously, the burial of 346 whales and other animals must have been quite rapid to preserve their bodies, not a slow burial at 0.1 inch a year.91 And why are land and sea animals buried together? Ground sloths never lived with whales. The Answer. The continental-drift phase ended with the compression event, the sudden crushing, buckling, and thickening of crashing hydroplates. [Page 499 explains why Earth’s mountains, such as the Andes, were pushed up in less than an hour.] Evidence of that compression event can be seen in Figure 50 on page 117, in thousands of similar places on Earth, and in all the "Seashells on Mountaintops" described on page 50. Not only did part of the seafloor rapidly rise to become the Andes Mountains, the overlying water was also lifted. It then drained down the rising slopes and back into the sea, sweeping with it stranded sea creatures and drowned land animals. Larger animals (whales, etc.) tended to become lodged in these streams, while smaller animals (fish, etc.) were swept into and out of ponds created by large animals damming up the flow. Sediments (especially diatomaceous earth, easily swept off the rising seafloor,) filled these ponds, fossilizing the larger animals. Mystery solved. More to Come. In the next chapter, you will see that hours before Earth’s major mountain ranges suddenly rose, the Pacific crust was pulled down, steepening the hydroplates’ downhill slide. The Ring of Fire, which surrounds the Pacific crust that sank, is the most volcanically-active, earthquake-prone region on Earth. Those initial volcanoes were probably the source of the volcanic ash that was mixed with the diatomaceous earth at the Peruvian site. Both these Chilean and Peruvian fossil sites lie on the thin coastline between the Ring of Fire and the Andes Mountains. Figure 83 on page 154.] As all these animals were fleeing east, away from the deafening sounds and shock waves coming from the west, the compression event began, and the seafloor beneath the animals rose.